I see my memory WAS correct; AND, the GRUMMAN photos DID in fact jog my memory; I DO recall seeing them, back in the day! Again, MANY THANKS to you, my friend, for taking the time to search for and then post these AWESOME photos! MaBSTOA had only one Flxible “new look”, number 7753, with batwings. It also had only one Grumman, number 631, with batwings. The photo of 8863 with the missing batwing panel was probably removed due to damage. In this later photo, you can barely see the panel that was reinstalled. Photograph taken June 30, 1975 by Doug Grotjahn; collection of Joe Testagrose at Battery Place & Washington Street. Here is something interesting I found searching the web from Boston, MBTA Pullman Trackless Trolley in Cambridge with what appears to be a busorama ad panel. 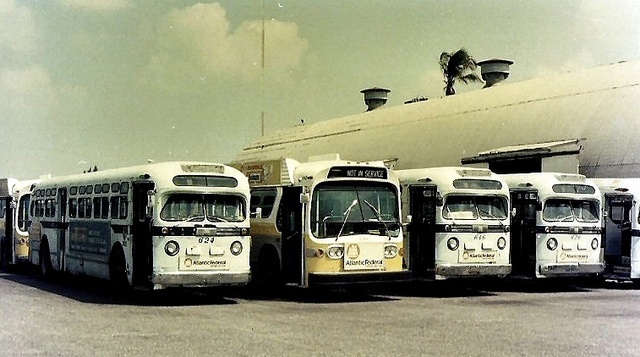 West Palm Beach CoTran had batwing buses as well. It would indeed seem that your "well" NEVER runs dry; GREAT pictures, as usual! NEVER saw the one of the Boston MBTA trolley bus sporting a prehistoric "BUS-O-RAMA" label; I have seen hundreds of Boston trolley coach photos over the years and this is the first time I ever saw a photo like this. Given today's extensive use of hi-tech electronics/LED's/etc., in advertising, it is quite interesting to picture today's modern transit buses outfitted with electronic "BUS-O-RAMA"-type ad panels. "Times Square On Wheels", perhaps........?? Thanks for this info; so, I guess the GRUMMAN's I recall sporting "batwings" was actually the SAME bus that I saw on different occasions! 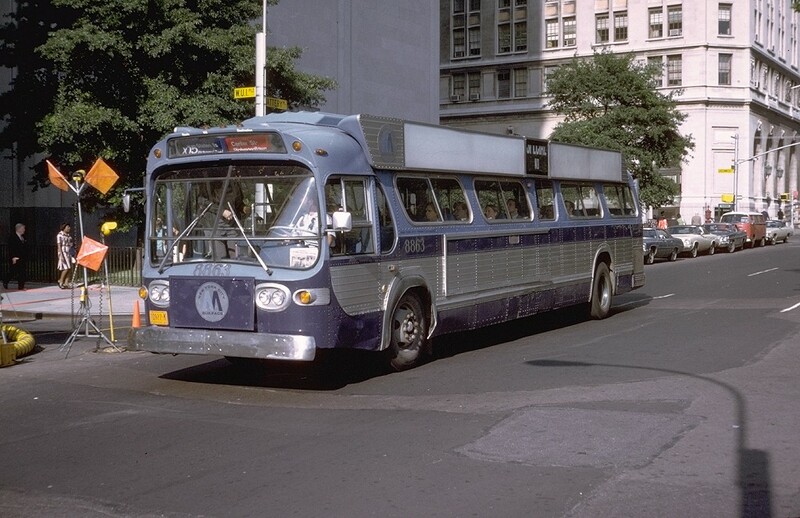 (2): When the "BUS-O-RAMA" era ended in New York, were the "batwings" simply removed from the buses while the buses themselves continued in operation, or were the vehicles retired and scrapped? (3): What city was the last to use them? About question #2: Several of the buses (only the A/C ones) that originally came with batwings, had them removed, and quite a few were rebuilt by Blitz and were renumbered within the 5000's and 5100's and served into the '90's. I'll leave the answers to questions #1 and 3 to the other experts out there. This I did not know.....thanks! ".........the 8000 series were all air-conditioned and had billboard advertising signs above the windows, obscuring the standee windows. Buses with billboard advertising had been on the increase since the prototype bus, #3472, was retrofitted in 1964....."
Regarding question #1… Likewise in Miami, Florida. 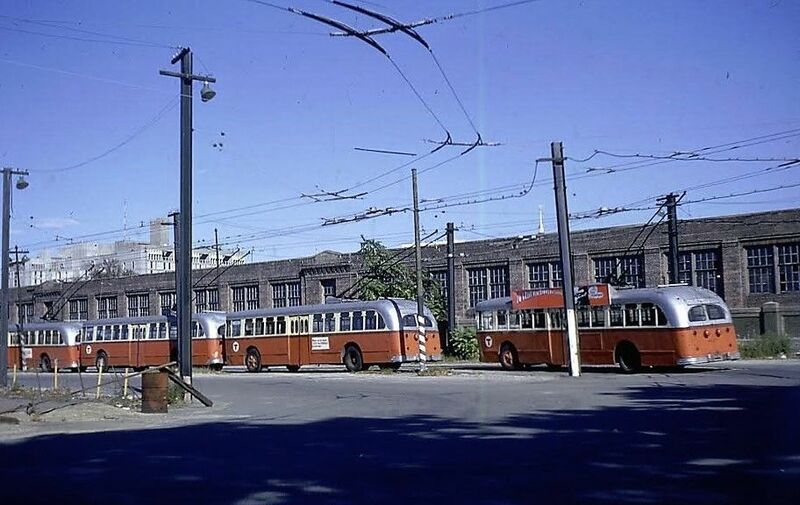 Once the batwings were removed, the buses continued on their merry way until either scrapped because of accidents, fires or simply retirement. 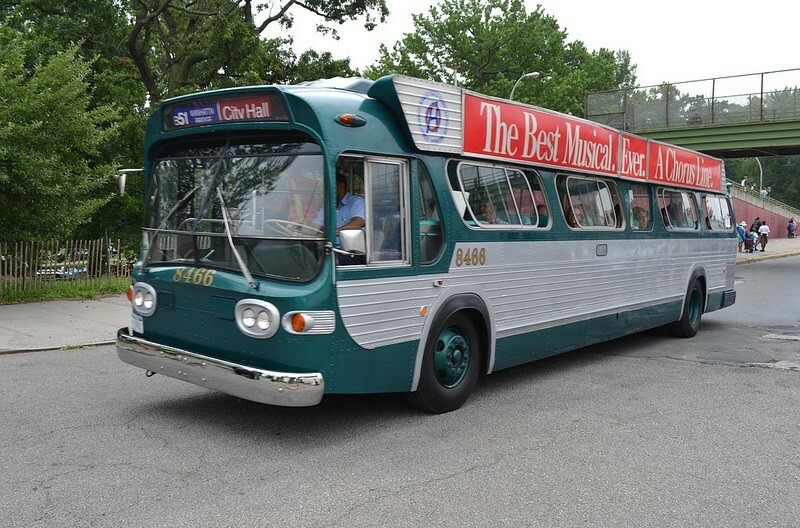 Regarding question #2… to my knowledge the only preserved bus-o-rama bus is number 8466 in the New York City Transit Museum fleet. I’m a purist, that means that if you are going to do it, do it correctly or not at all. However, I’m very happy to see that the NYCTA did preserve this bus. There are some discrepancies between the preservation and the way it was delivered. a)	Lacks ad racks, on both sides; rear and front. b)	The anodized aluminum belt where it meets the side quarter window right before the fleet number – currently painted with an incline /triangle. As delivered this was a straight cut, no incline. c)	No batwing routing signs. d)	The “OA” or the later “M” sign was not a decal but a metal circle with the decals on it. e)	The grab handles have been removed from the overhead hand grab rails. You can see the screw holes on the grab rails. f)	These buses had hard plastic longitudinal seats. This bus has high back upholstered seats when it was put into express service. In one of my previous posts I discussed the destination sign configuration of the batwing buses. I forgot to mention that these buses had a front destination sign; two side batwing mounted routing signs; rear windshield curb side they had a box with space for three digits. No prefix letters. Regarding the comment by Guy E. Martin in his book… the buses with factory installed batwings… they did not obscured the standee windows since these buses DID NOT HAVE standee windows. There are other photo caption errors in his book.